SOIL&”PIMP”SESSIONS / SPECIAL OTHERS / mabanua / KID FRESINO / Awich / STUTS / toconoma / ADAM at / Schroeder-Headz / TRI4TH / JABBERLOOP / 踊ってばかりの国 / CRCK/LCKS / Nao Kawamura / Last Electro / テスラは泣かない。 / SuiseiNoboAz / Lucie, Too / The Wisely Brothers / Luby Sparks / ザ・おめでたズ / BROTHER SUN SISTER MOON / 座布団5000/ / DJ New Action! (星原喜一郎 / 遠藤孝行) … and many more!! 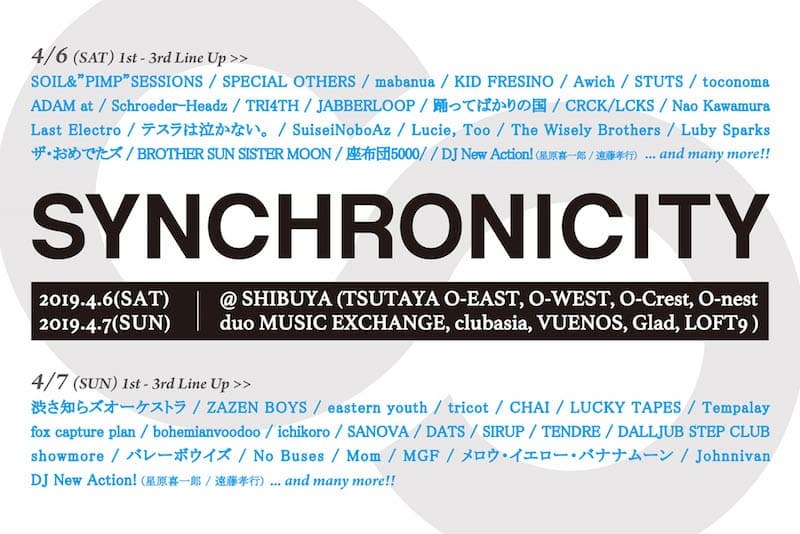 渋さ知らズオーケストラ / ZAZEN BOYS / eastern youth / tricot / CHAI / LUCKY TAPES / Tempalay / fox capture plan / bohemianvoodoo / ichikoro / SANOVA / DATS / SIRUP / TENDRE / DALLJUB STEP CLUB / showmore / バレーボウイズ / No Buses / Mom / MGF / メロウ・イエロー・バナナムーン / Johnnivan / DJ New Action! (星原喜一郎 / 遠藤孝行) … and many more! !